Preference will be given to Ph.D. Forestry/ NET qualified candidates who are well versed with PRA/ econometric tools and data compilation. The application complete in all respects including name/ permanent address/ correspondence address/ contact number/ e-mail ID/ date of birth/ qualifications/ publications, work experience and an affixed recent passport size photograph should reach to the Principal Investigator’s Office latest by March 20th, 2019. Interviews for the said position shall be conducted in the Dean’s Office, Faculty of Forestry, SKUAST-K, Benhama, Ganderbal on March 25th, 2019 at 11 A.M.
1. The appointment shall be contractual and co-terminus with the project. 2. The appointment shall be governed by terms and conditions of the project funding agency (National Mission on Himalayan Studies, MOEF & CC, Govt. of India). 3. No TA/DA shall be paid for appearing in the interview. March 25th, 2019 at 11 A.M. Junior Research Fellowship Vacancy – Last Date 20 March 2019 (Srinagar, Jammu and Kashmir), Sher-e-Kashmir University of Agricultural Sciences and Technology of Kashmir (SKUAST-Kashmir) recruits Junior Research Fellowship post. B.Sc./M.Sc., PhD/NET experienced candidates can apply. Sher-e-Kashmir University of Agricultural Sciences & Technology of Kashmir(Hindi: शेर-ए-कश्मीर कृषि विज्ञान एवं प्रौद्योगिकी विश्वविद्यालय) is an agricultural university located in Srinagar, Jammu and Kashmir, India. With its main campus in Shalimar, Srinagar, the University has multiple campuses, colleges, research and extension centers across the Kashmir Valley and Ladakh regions of the state. 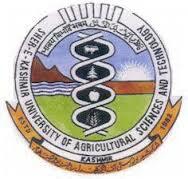 Contact Us:Sher-e-Kashmir University of Agricultural Sciences and Technology of Kashmir. Shalimar Campus, Srinagar, J&K, India. 190025.